Last week, Kavana deepened our efforts to help address Seattle's homelessness crisis with an opportunity to learn more. Two dozen people gathered to watch a screening of Trickle Down Town, a documentary that sheds light on roots of the homelessness crisis, introduces a variety of people working to address the problem, and, most importantly, reminds us that people experiencing homeless are people with complex and rich lives. Shockingly, there are 12,000 homeless people in King County, and this film showed us their real faces and stories, including many you would not expect, from an employed mail carrier to a laid-off machinist to an artist. After the film there was a lively discussion with the filmmaker, Tomasz Biernacki, and Josh Castle from the Low Income Housing Institute, which runs many of the Tiny House Villages around the city. Attendees got to learn more about how these villages provide an important step towards permanent, stable housing by providing safety, community, and support. At the end of the evening, we captured reactions to the film and discussion in writing. 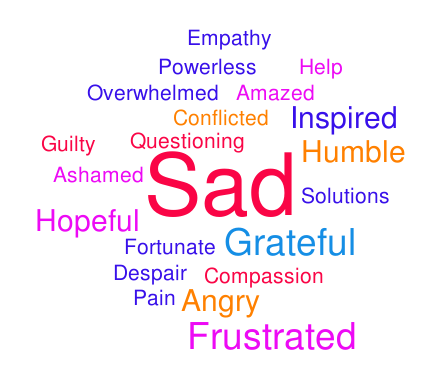 In these "word clouds," you can see the mix of emotions that confronting homelessness stirs in us, and the overwhelming desire we felt to do something! In that spirit, we invite you to join us as Kavana hosts and shares a potluck dinner with residents of the Northlake Tiny House Village on Sunday, April 28th from 4:30p - 6:30pm. 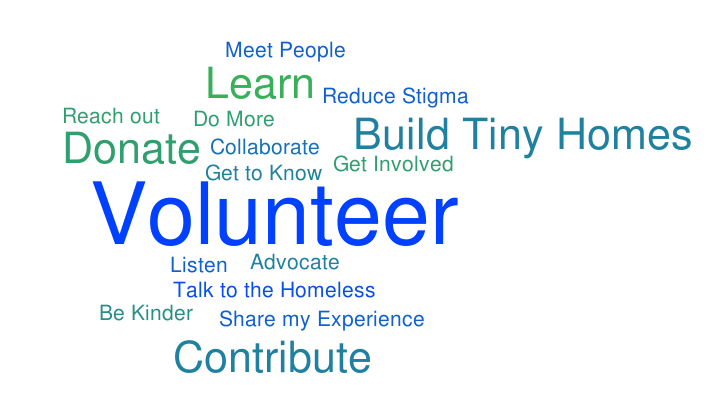 This is a way to meet some of the real people experiencing homelessness in an interactive setting, and to expand our sense of community to include those who are often marginalized. It's also a great way to respond to the Passover seder's call to "let all who are hungry come and eat" (and this activity is conveniently timed to be the day after Passover ends!). Sign-up here. This potluck will be followed by more opportunities for action around homelessness and housing issues. Email Rabbi Josh if you'd like to get involved in these efforts! There is another common denominator in the tragedies mentioned above: all of these terrorist murderers were motivated specifically by white supremacist ideology. Although today’s attack took place half-way around the world, we live in a global world, and it seems that the twisted inspiration for this particular attack came specifically from a global network of online extremists. Of course, we have all seen manifestations of white supremacy, racism, Islamophobia, toxic masculinity, abuse of the internet, and the idolatry of the gun closer to home as well…. enough to know that we must stand up to these destructive forces wherever we see them.